There's the first challenge of the year going on at The Sketchy Challenges blog and the theme is "sketch". You have until the end of the month to join. I still have to make quite some birthday cards, so I made one for this challenge. 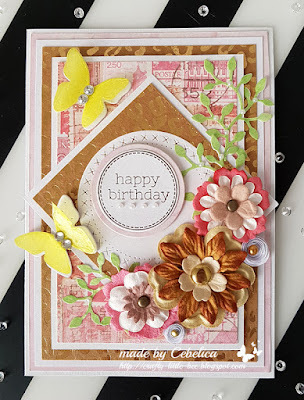 For this card I used different papers and embellishments from my stash. 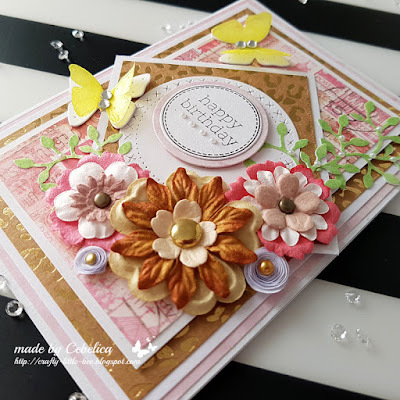 The sentiment is from Whimsy stamps.I used CC designs and Cottage Cutz dies for the butterlies and leaves. I hope you will come play with us. Have a beautiful day! Beautiful card maja, love all the pretty embellishments. so beautiful, I love all the embellishments! Awesome card. Thank you for play with us at Polkadoodles Challenge. Good luck with your entry.